Siyabonga Radebe (also known in comedy circles as Siya B) is a South African actor, singer, writer, director and standup comedian best known for his role as Cassius in the SABC1 drama series A Place Called Home, from 2006-2009. He is also known for his role as Boboza, a troubled musician who commits suicide, on the e.tv soapie Rhythm City, in 2010. Other television series he has acted in include the SABC1 drama series Intersexions, the SABC1 mini-series uGugu no Andile, the ITV drama Wild at Heart and the SABC1 legal drama series Sokhulu & Partners. He has also had notable roles as Benjy, the on-screen lover of Katlego (Lerato Mvelase), on the SABC1 drama series Home Affairs; and as Xolani Mthembu, a "Ben 10" (toy boy) of Mam'Ruby (Slindile Nodangala), on the SABC1 soapie Generations. He also played the role of Obesandjo's 1st Lieutenant in the award-winning science fiction film District 9, in 2009. 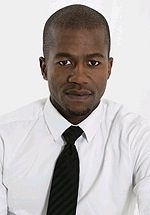 Awarded a National Diploma in Drama from the Durban University of Technology, Siya has also appeared in a number of theatre productions including Blacks Like Me (directed by Aldo Brincat), Cheap Show (directed by Craig Vinjoan), Closer (directed by Sello Maake Ka-Ncube) and Grin and Bear It, directed by Tim Plewman. In 2012 he was featured as one of the comedians in the live show (and television episode) of Comedy Central Presents... Live at Parker's. Originally from Durban, he currently resides in Johannesburg.